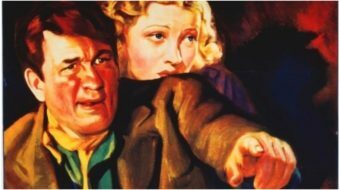 In Dennis Broe’s excellent book “Film Noir, American Workers and Postwar Hollywood,” there is an attempt to categorize the film noir movies of different time periods. His time frames are slightly different from Paul Schrader’s three periods theory from his seminal “Notes on Film Noir.” Broe likely does this to drive home his point about the rightward political shifts of the United States after the Second World War. His numbers for 1945-1950 film noir included significant numbers of movies in categories such as “working class fugitives” (28 films), “social problems” (16), “war veteran ” (16), and “depression-era drifters” (nine). Even in an on-its-face “apolitical” movie such as the incredible Double Indemnity, there are currents of discontent towards the wealthy – including Edward G. Robinson’s detective openly mocking the executive of his insurance company in hilariously insubordinate fashion. The core of the movie may be the James M. Cain story of a femme fatale, but the assumption of the time is that the man in the big office doesn’t know what’s going on in the trenches. However, by 1950-1955, in the wake of increased House Un-American Activities Committee activity and McCarthyism, the sub genre of film noir shifted significantly. In those years, Broe measures the rise of the “mainline procedural” (95 films) as well as the “psychotic fugitive” (50), and the logical conclusion of the psychotic fugitive – the “vigilante cop” (14). What happened? Why the shift in sub genres from the ’40s to the ’50s? No other than Ayn Rand was enlisted by Ronald Reagan, Johnston, and others to write “A Screen Guide for Americans,” which instructed writers on how not to “smear the free enterprise system,” not to “deify the common man,” and reminded artists not to “show that poverty is a virtue” or “that failure is noble.” The guide might have been ignored by many screenwriters, but it remains a fascinating document of the time and was light years away from the “popular front” ethos of only a few years earlier, where the vast majority of noir movies had working or middle class protagonists and a classic like Casablanca embraced the need for collective action (as opposed to individualism) behalf of the allied nations. In earlier years, the censorship of the Hays Production Code meant a good noir film like Crossfire had to be changed to be about the perils of anti-Semitism (also at the time, that meant a statement against fascism) as opposed to homophobia, as in the novel. Still, even though progressive politics had boundaries in the Hollywood of the 1940s, such politics were basically considered acceptable. But by the early 1950s, the economic reality of trying to make such a film within the system (or even to get a movie made outside the studios to be shown to any sizable audience, as was the case with the explicitly radical Salt of the Earth) was increasingly impossible. There were even a dozen or so explicitly anti-communist hysteria movies in that time, including I was a Communist for the FBI, a noir commercial failure, though it picked up an academy award nomination for “best documentary.” The movie was to some extent inspired by an actual agent’s work in Pittsburgh in the internal fight in the United Electrical Workers, greatly aided by McCarthyist and even liberal forces (including Pittsburgh “Labor Priest” Father Owen Rice) intent on removing Communists and their allies from that strategic union. But research today seems to indicate that the actual informer did almost no notable work within that fight and the movie is widely considered more fiction than “documentary” in retrospect. Orson Wells managed to keep some of the popular front spirit alive for a time, but less explicitly and less frequently than before the war ended – and others who came from the New York City’s left wing 1930s theater tradition often ended up with no careers at all. Welles’ 1958 Touch of Evil is widely considered to be the last movie of the noir cycle, dating back to 1941. However, just like the detective novel, there was a return to movies that had more progressive and international trends, in “neo noir”, which could be applied broadly to any film noir oriented movie after the 1950s. The 1961 Blast of Silence bucked the tendency towards the procedural early on, probably because it was a small independent film that broke out of the studio system. Jean Luc-Godard’s 60s movies such as Breathless and Band of Outsiders, anticipated the arrival of angry youth subculture, while being rooted in a film critics’ encyclopedic knowledge of earlier American classics, while his Alphaville extended noir to science fiction. 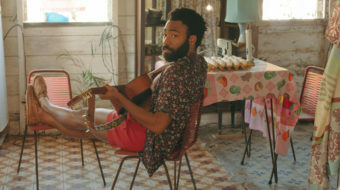 The 1970s took audiences to Harlem in the noir-ish Across 110th Street, a return to Los Angeles in the properly cynical and masterful Chinatown, and even Robert Altman updated Phillip Marlowe into an era of yoga, youth protest, and cocaine in his The Long Goodbye, which seemed to have a subversive disdain for the genre it was being made in. These new talents brought influences such as surrealism (especially Lynch and David Cronenberg as North America’s mainstream envoys to the avant garde), overt homages to genre films, and references to the original source material for film noir. The Coen brothers’ Miller’s Crossing and The Big Lebowski specifically used story lines from Hammett’s The Glass Key and Chandler’s The Big Sleep respectively. The Big Lebowski may be best known for its cult following as a “stoner noir” flick, but also is a good example of how the Coens’ combined their referential style with a philosophical or political point, using their two main characters as a commentary on an aging 1960s hippie who claimed to co-author the “original Port Huron statement” (not the later compromised draft, perhaps edited by Michael Harrington) and his neo-conservative veteran bowling buddy who rejected pacifism in the face of the Vietnam and Gulf wars. “The Dude” and Walter were colorful characters in their own right, but they were also a throwback to archetypes of the unemployed drifter and war veteran from classic noir. From the 1940s to the present, film noir and neo noir has consistently been contested ideological territory, with artists, studios, producers, and censors responding to — or ignoring — the issues of its day. 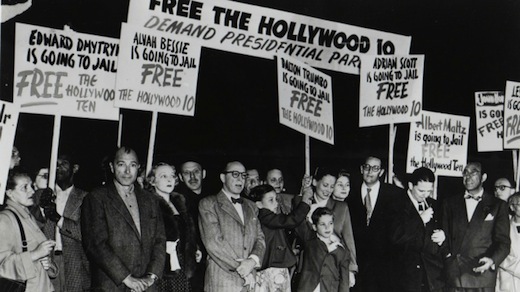 Photo: Demonstrators join one of many protests against the Hollywood blacklist and the jailing of the Hollywood 10, a group of screenwriters and directors who stood up to government attacks on freedom of speech and association (via Free Film School). Chris George lives in Pittsburgh's Northside. 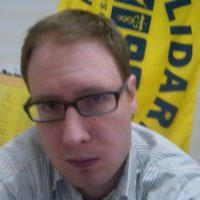 He has worked in retail, warehouses, call centers, on tow boats, and as an organizer. His interests include philosophy, history, board gaming, and sports. He has coached boys' basketball and women's football. His daughter is a second grader who recently called for her classmates to insist recess not be cut short for additional school work.